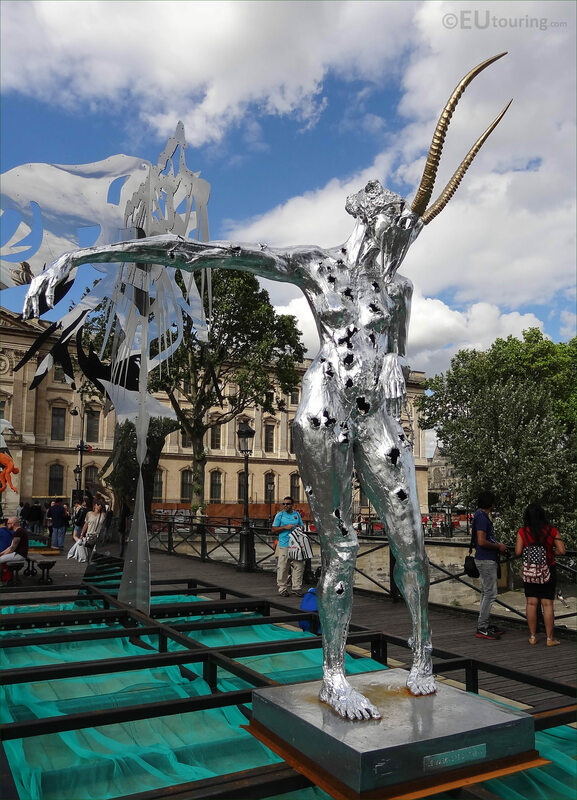 We took these high definition photos showing a contemporary art statue called Le Massacre d'Athena, which was sculpted by Daniel Hourde, that was part of the Passerelle Enchantee exhibition on the Pont des Arts in Paris. 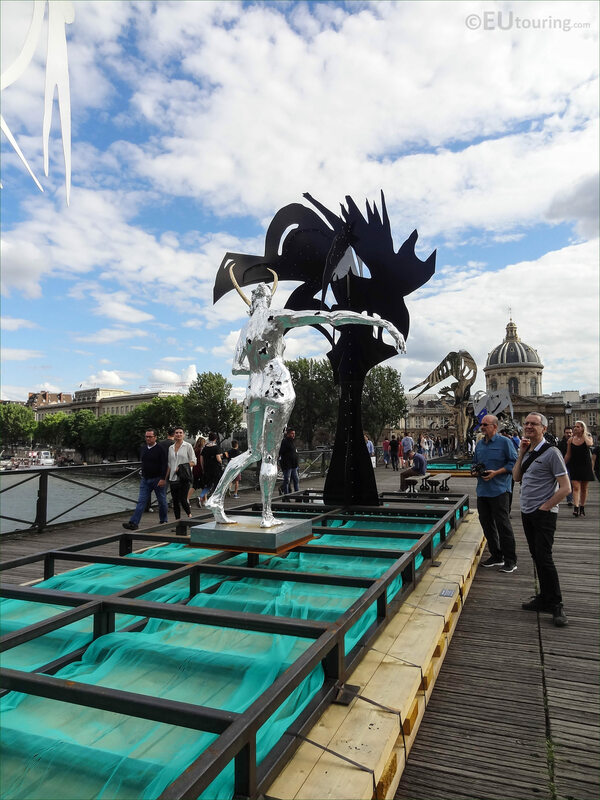 This first HD photo shows a silver coloured statue called Le Massacre d'Athena, which was produced back in 2007, and translated into English, this is called The Massacre of Athena, and is part of a temporary exhibition called La Passerelle Enchantee. You will find that this contemporary art statue was sculpted by Daniel Hourde and was based upon the mythical Greek Goddess of Arts, literature, wisdom and courage with intelligence in war, and the Goddess Athena is often portrayed with a mask, as you can see in this close up photograph. 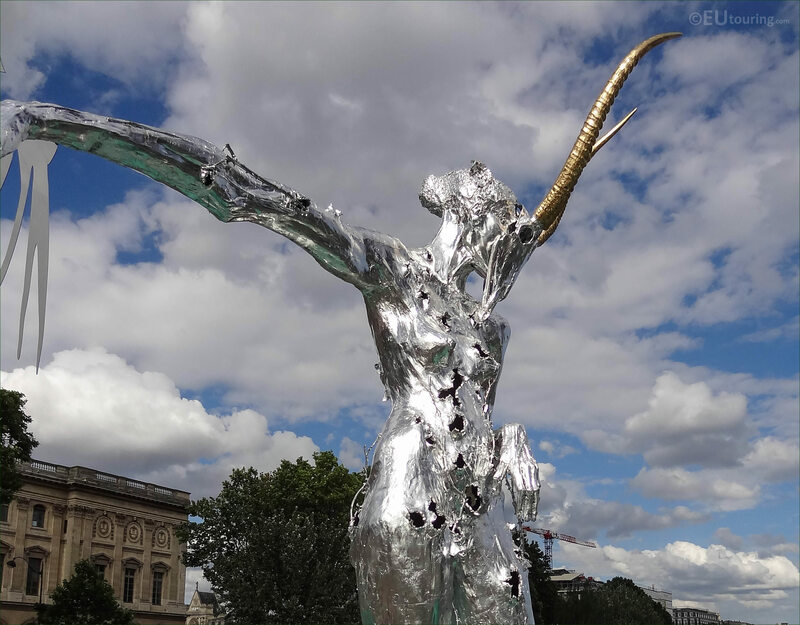 But here you can see the entire statue of Le Massacre d'Athena, which was sculpted in bronze and coloured silver, yet with golden coloured horns on the mask, and you will find that much of the work by this artist portrays distorted, unusual or grotesque figures, rather than pure forms, like you would often see Athena portrayed. 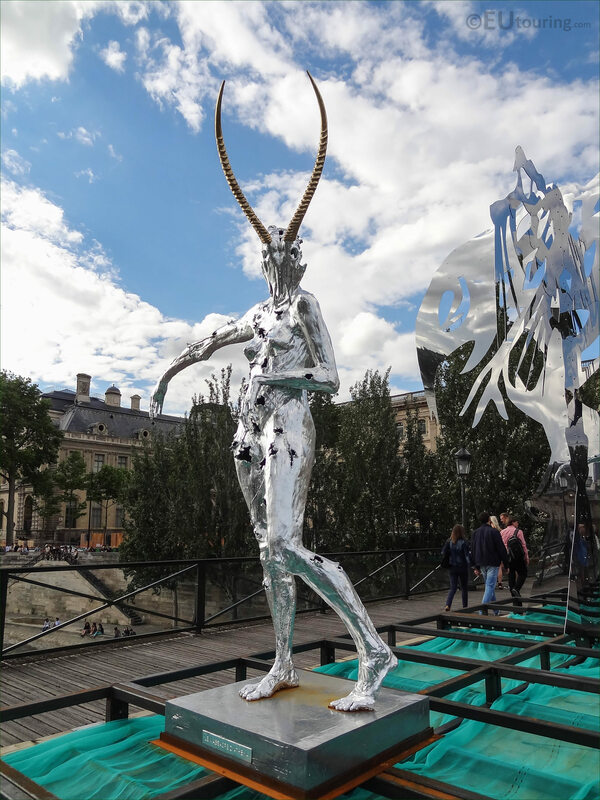 Now we mentioned earlier that this statue is part of an exhibition called La Passerelle Enchantee, which in English translates to The Enchanted Footbridge, and this is a temporary installation on the Pont des Arts, which is a pedestrian bridge that spans the River Seine from the Musee du Louvre to the Institut de France. 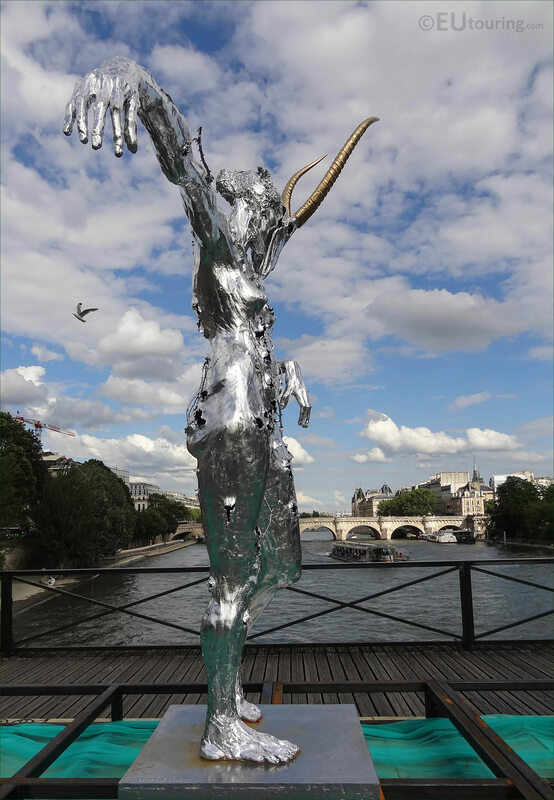 For several years the Pont des Arts was referred to as the Bridge of Love, and people used to place padlocks, known as love locks onto the railings, but these have been replaced with plexiglass, providing better views, as you can see here, yet the City of Paris also wanted to still keep people fascinated and enjoying this historical bridge. 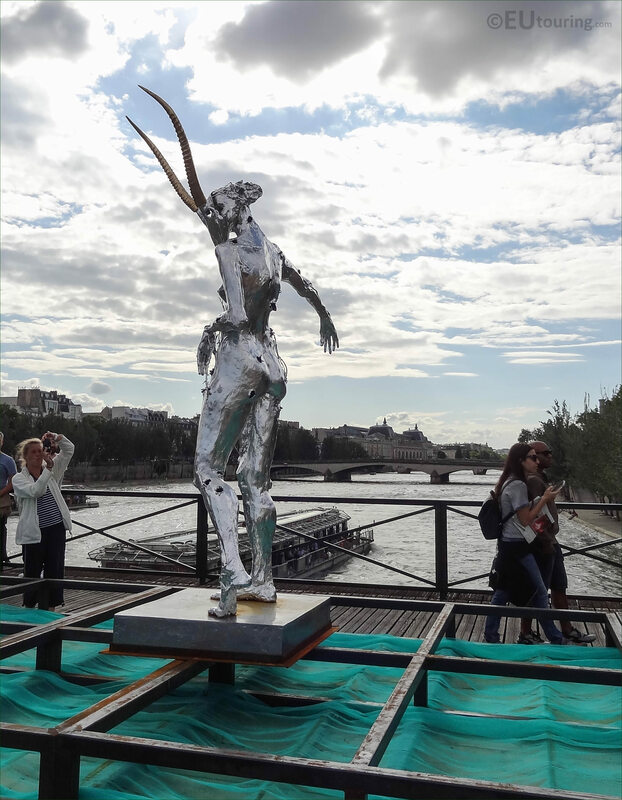 So the idea of placing temporary art works on the bridge, to bring it back to its roots when it was named after the Louvre Museum was once called the Palais des Arts, and Daniel Hourde also relates back to the Pont des Arts and the original ideas of the architects for it to be a suspended garden for intrigue and promenading. 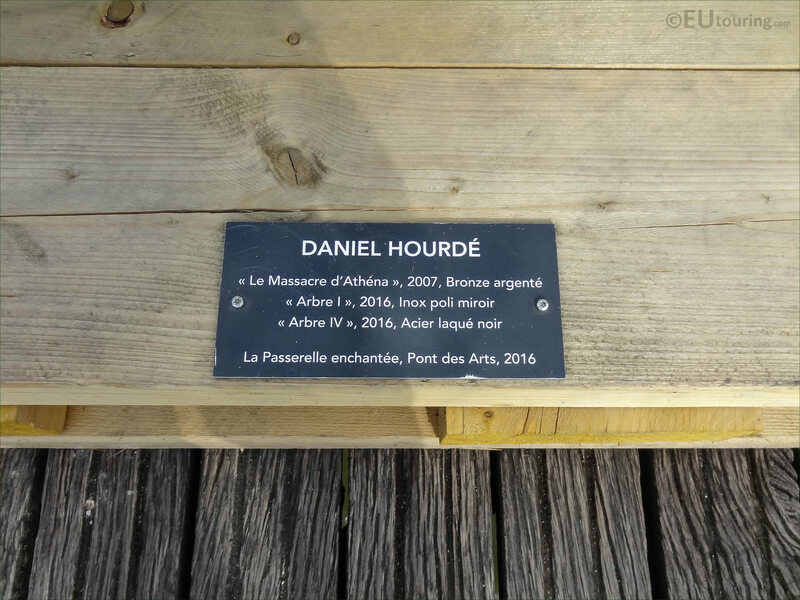 Therefore, as you can see from this close up photo showing the tourist information plaque, on this particular platform there is the statue called The Massacre of Athena, but two others called Abre I and Arbre IV, which is Tree 1 and Tree 4 in English, and these three plus several other sculptures in The Enchanted Footbridge exhibition were produced by Daniel Hourde.